The lion is a member of the genus panthera and the second largest big cat, losing out only to the slightly larger tiger. With the male lion adorned with a distinctive mane, which is unique in the Genus panthera, has made the lion an iconic worldwide image even more so than the other members of the panthera family. The female lioness still retains a similar size and stature to the male lion but does not have the mane. This difference in appearance between the two sexes of lions is unique in the genus panthera family, it’s believed that the females as hunters don’t have a mane because it would impair their ability to stalk and catch prey. The lion uses it’s mane in confrontations to make themselves appear larger than they are. There are other slight physical differences in male and female lions, the males of the lion family also possess a feathered tail which again is supposed to serve a purpose but this time in attracting themselves a mate. Lions were at one point a very widespread species, only coming second to humans and living in a variety of environments accross the world. Currently Lions are spread out across Asia, Saharan Africa and a small population still living in India. Lions are socialable group animals and live in packs called prides. These prides are not necessarily family specific but often lions and lionesses from different families mix together. 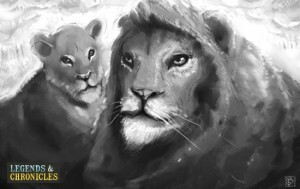 The pride will always have a head male or alternatively two or three head males in the group who share the responsibility and will fight with any nomadic lions who try to invade the pride in search of a partner. When lions or lionesses are not in a pride they will often roam in smalls groups for safety and to allow a dominant integration into a new pride. Usually dominance of the pride will be forced by scent marking from rivals males or groups of males, but in some cases the current head male lion will step down and allow the younger lions to take charge. It believed that the average term that a lion or a group of male lions will be head of the pride is around 3 years. Lions are like other big cats capable of making a wide range of noises, from purring, growling, barking, meowing, howling, hissing and roaring. It’s very common for a lion to roar at night as a sign of its presence. Out of all the big cats the lion possesses the most distinctive and loudest roar. The lioness is typically the hunter of the group and will often be the one that will make the kills for the prides. The Lionesses are very good at doing this, they are fast and powerful, and are adept at hunting in groups or alone. Using their speed and power the Lionesses are able to easily bring down large prey. Even though the Lionesses usually make the kill the Lion is always allowed to feast, which is a sign of status in the pride.